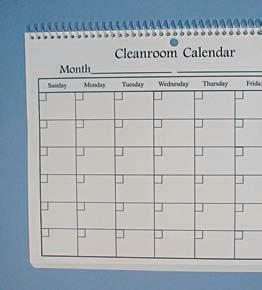 This 15 month calendar printed on 28# cleanroom paper and covered in semitransparent high-density polyethylene features 15 single-sided calendar sheets. 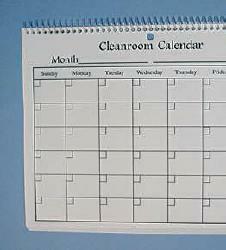 Each sheet is blank, without any months or dates printed, enabling use to begin at any time of the year. Calendar measures 11" x 8.5". 10 calendars/case. Priced and sold by the case. See our 52 week day planners here.